Welcome to Engineering and Technology! A class designed for students to experience, explore and learn about a variety of technologies. While many assignments are delivered through Google Classroom, students will need paper, pencil, and a notebook/binder for class each day. Each student is required to bring their agenda each day. Further, each student is required to bring earbuds with them each day. Please bring your positive attitude and willingness to try new activities! In Engineering and Technology class, your grade will be determined by several factors. The main concern being that you have a successful learning experience. The following percentage system has been designed to provide a fair and accurate account of your progress. Below is a listing of the percentages and a grading scale for your information. Weekly Participation Points are worth 30% of your grade - you are expected to come to class on time and work to the best of your abilities. You will need to maintain a proper attitude towards your daily assigned work and exhibit a proper work ethic. Part of your daily participation grade entails "Keeping It R.E.A.L." Participation points will given at the end of the week. Projects are worth 50% of your grade - Due to the nature of this class, a large portion of the student's grade will be directly tied to the completion of in class projects. Project-based learning is a large part of Engineering and Technology. 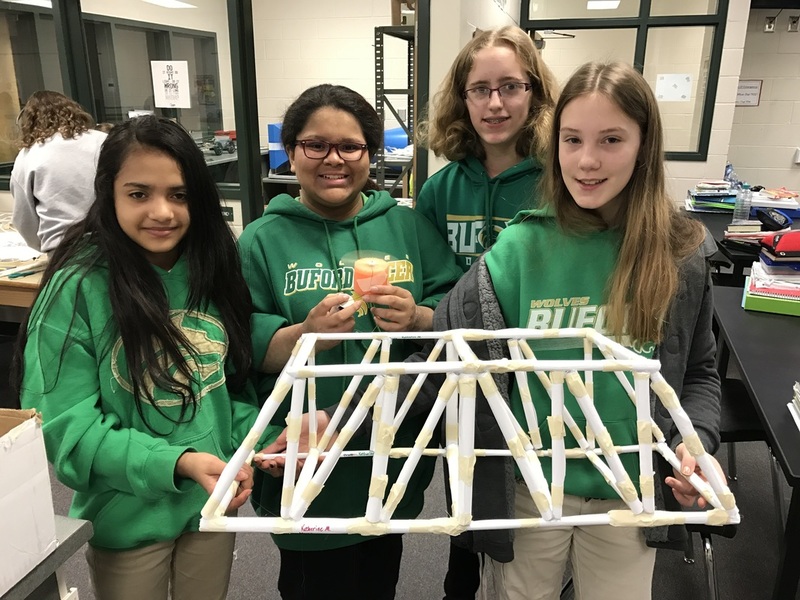 Quizzes and Tests are worth 20% of your grade - Students will be required to take periodic quizzes and tests to assess their understanding of the Engineering & Technology curriculum. Students are to study accordingly for assessments. Students will receive an 11 point deduction on projects, quizzes, or tests that are submitted late. Additionally, a late submission will be counted if one or more partner(s) forgets to appropriately name their project or project file. Student work will be accepted up until the final class day (not the Paw Print Party day) and will automatically receive a 21 point deduction. Responsible – meaning we will use the classroom materials appropriately, bring our materials to class, and turn our work in on time. What we are learning in class is important and will be beneficial to you in the future, and I expect you to take class seriously. Excellent in every way – meaning students will try our best to exceed all expectations. We will push ourselves to be better at everything we try. We are capable of accomplishing whatever we set our mind to; we just have to believe in ourselves. You need to believe in yourself and know that if you put in the needed effort you will be successful, not only in class, but in life. Successful Learners – meaning we will come to class ready with our materials to learn the skills required. Students are expected to bring paper and pencil daily to class. Wasting, overusing, playing and horsing around with, or mishandling supplies. Tampering with the classroom thermostat or light switches. Failure to properly clean up work area at the end of class. Disrupting classroom lecture with excessive talking. Repeated verbal reminders to be on task and working. Repeated tardiness or failure to arrive at class on time. Unnecessary, frequent or excessively asking for repeated bathroom and/or water breaks. Using the computers, tablets and/or Internet inappropriately. Preventing or distracting other students from completing their work. Not actively participating in group assignments. Disregarding directions and/or repeatedly ignoring teacher commands. Disrespecting or teasing other students. Eating, Drinking, or chewing gum in class without permission.